As the last match before the Christmas break, Carrigtwohill United Under 17’s were treated to an evening game at Ballea Park under lights and on Astro. Only for the all weather surface, the game would surely have been called off – many other games were – given the terrible weather on the night and in previous days. Carrigaline started better, holding the ball, pushing Carrigtwohill back and putting pressure on the first ball out of defence. On the other hand, they could not get close to goal and Carrigtwohill weathered the storm, gradually establishing a foothold in the game. The visitors started to play the better football, leveraging the excellent surface to deliver convincing short, close passing. In was only a matter of time before the scoring began and the first goal came on 16 minutes courtesy of a superb cross from the right by Sidas Pilivicious which floated over the hands of the keeper into the far top corner. Carrigtwohill could have scored more when Jotham Crabb found some space in the Carrigaline defence, but he could not let flight from his favoured left foot before being closed down. The home team had other ideas anyway and equalised from a superb volley under the crossbar after a pull back cross had deceived the Carrigtwohill defence. There was time for more action before the end of the half as Abdul Rahim Mohammed stole the ball back from the Carrigaline defence and slotted the ball inside the post with accuracy from 22 yards. Carrigtwohill’s lead would not survive long however as a high ball hanging in the wind and rain which was now falling heavily floated beyond Carrigtwohill’s keeper and the Carrigaline striker got to the ball first. The game got into another gear in the second half altogether, with Carrigtwohill piling on the pressure in search of more goals. In quick succession, two long balls were allowed to bounce between the midfield and back lines to deliver two opportunistic goals for the home team. The first one in fairness was a work of genius as Carrigaline’s striker receiving the ball with his back to goal 30 yards out, hit it first time on the turn to give no chance to the advanced Darren Flynn. And so with exactly one hour gone, Carrigtwohill found themselves 4-2 down in the space of 2 minutes. What followed can only happen so many times in one season as Carrigtwohill went in search of the win. With both full backs moving up the field, the visitors kept going. Jack Nolan had replaced Ebe Imoh at left back and he delivered new impetus to go forward. On 71 minutes, Robert Adam who was playing between the lines at 10 intercepted a Carrigaline ball out and unleashed one of his trademark hard shots. The ball bounced in front of the keeper who could only parry in the path of Abdul Rahim who buried his second of the evening in the roof of the net. This was critical as with 20 minutes left, the task now seemed possible. Still it took 10 minutes for the equaliser to come as James O’Shaugnessy continued his impeccable performance with a run out of defence to put Evan Donnelly through, to angle his low shot past the Carrigaline keeper. 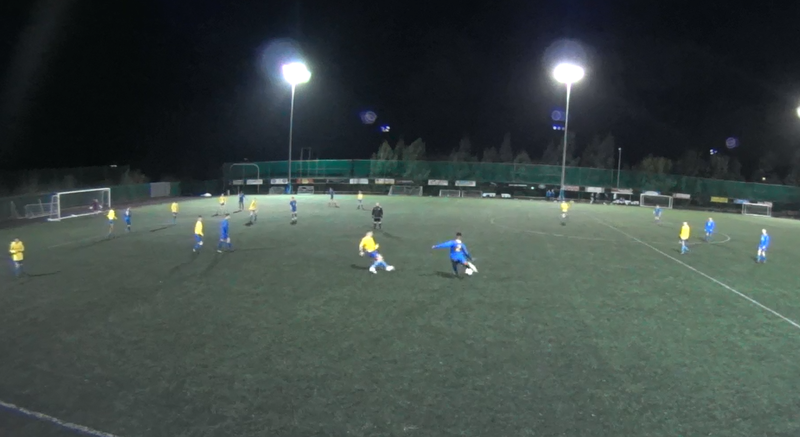 Only 5 minutes later, with only 3 minutes left on the clock, James O’Shaugnessy ran out of defence after great midfield defending by Carrigtwohill and delivered a cross field pass up the left wing to Abdul Rahim who found the advancing Jack Nolan on the corner of the 18 yard box. Jack’s cross took a deflection onto the near post and deceive the keeper as Jason Daly ran through the centre backs to bury the ball from close. From 4-2 down to 5-4 up in 16 minutes, was commendable but there was more to come as Carrigline got a very dangerous free kick 30 yards out. Thankfully, Ben Kearney was ideally positioned to clear with a powerful header and chase his own ball out, bringing play back in the Carrigline half and keeping it there until the final whistle. What a team effort – one to remember. Man of the match is a tough decision in such a game, but it goes to the right back James O’Shaugnessy who had an impeccable evening and delivered two key through balls for the 4th and 5th goals.